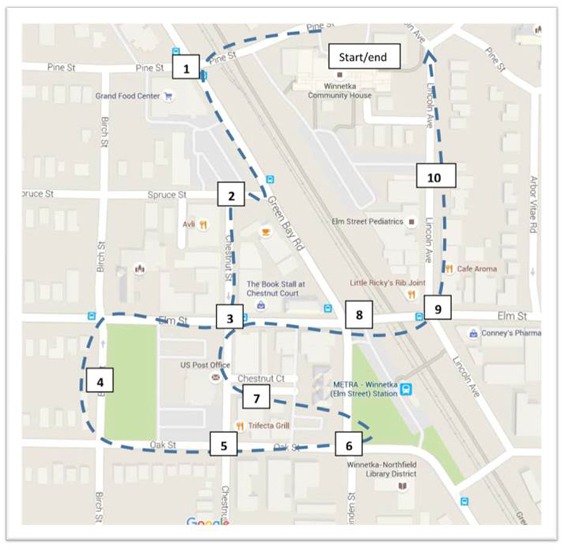 As part of the Village of Winnetka Streetscape and Signage Plan, the project Task Force and interested stakeholders are invited to take this self – guided walking tour of the Elm Street District (Downtown). It is understood that members of the group will be well aware of the area, its businesses, its strengths, and its weaknesses. But the walking tour is a chance to see it differently; to view the area specifically from a project planning perspective, not looking for a parking space or thinking about what to have for dinner. This is a chance to really start focusing on the study area and its future. Feel free to conduct the tour with fellow community members. At each of the numbered stops, pause briefly to consider the points listed in this survey. Keep in mind, the purpose of this tour is to set context for the work to come. The focus is to casually visit the area, see it with fresh eyes, and consider its future. Do not look to come up with the right answers just yet; this tour certainly does not cover every issue facing the district. A primary goal is that as the plan moves forward, those involved will be working from a common picture of the study area.